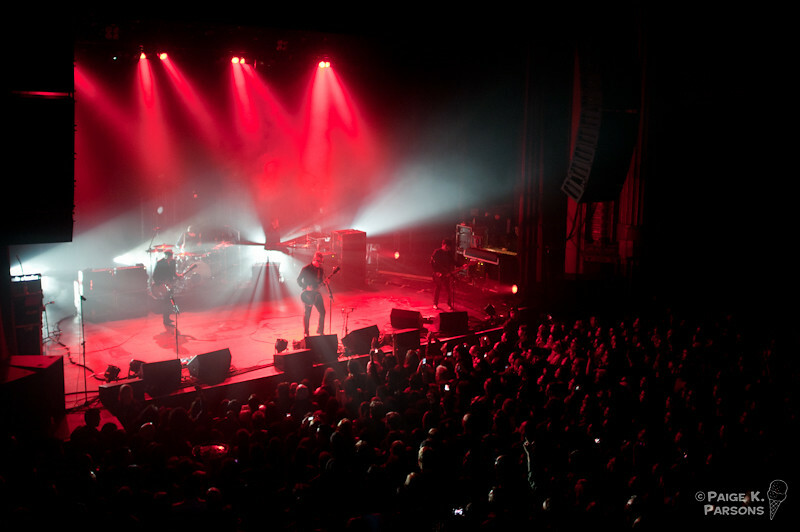 Interpol played The Warfield Theater in San Francisco last Monday. If you’ve ever seen Interpol live, the three-point-executive-summary should come as no surprise: The band was tight and well-rehearsed, their live renditions sounded identical to the recorded versions, and you couldn’t really see the band because it was dark and they were primarily backlit. I could wax on about these three points, but why? My husband and I are long-time interpol fans. We knew all the above when we bought tickets. 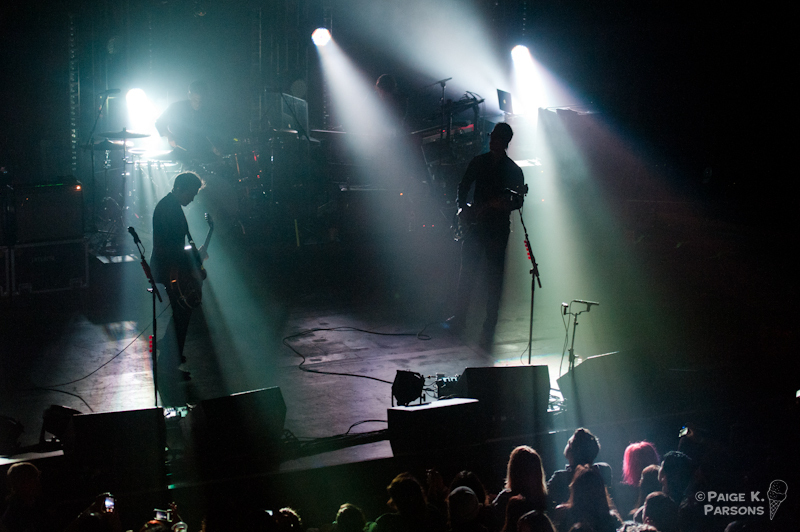 I also knew damn well that Interpol would be playing in the dark when I requested a photo pass. 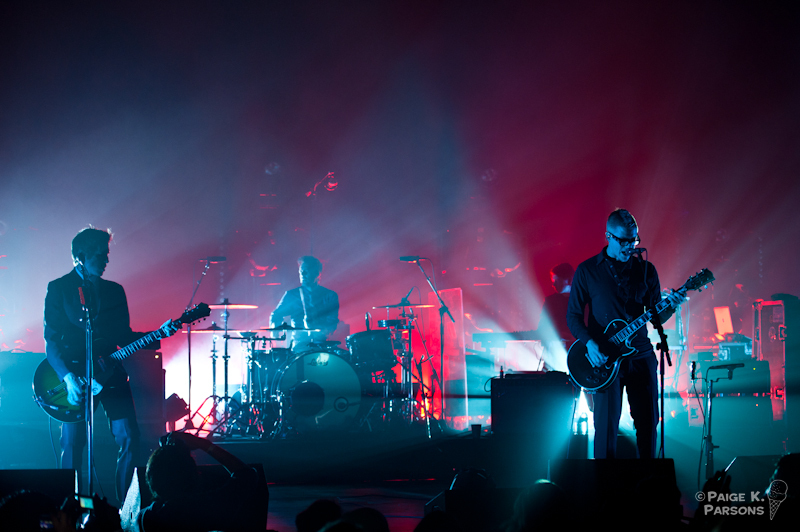 What I found interesting about Interpol’s live performanced wasn’t what was the same, it was the subtle things that were different. The most noticeable change from previous tours was the huge light show. The Warfield has zero backstage area, so as we walked up to the venue it was impossible to miss the case after case of gear market “lighting/strobe” along the side of the building. Seeing the dozens of lighting cases, for a few brief moment I let my imagination run wild. 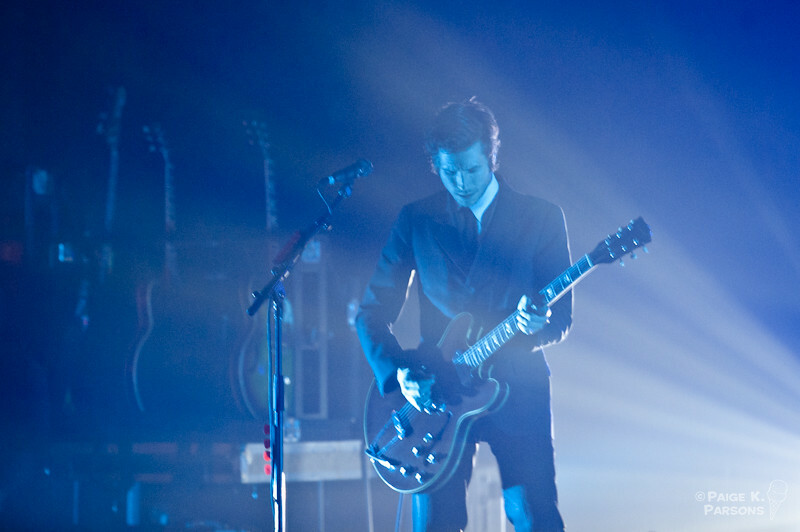 I started day-dreaming of a bright (but dreamily) lit Paul Banks, with oodles of fog behind him. But I quickly shook this fantasy off, knowing full-well that even with all this lighting, there would be some way for the band to hide in the shadows. My instinct was correct. When the band took the stage, it was a strnge irony to see the 1,000s of lumens of light emanating from behind the drummer’s stool, yet because these huge lights were from behind, everyone on stage remained shrouded in darkness. 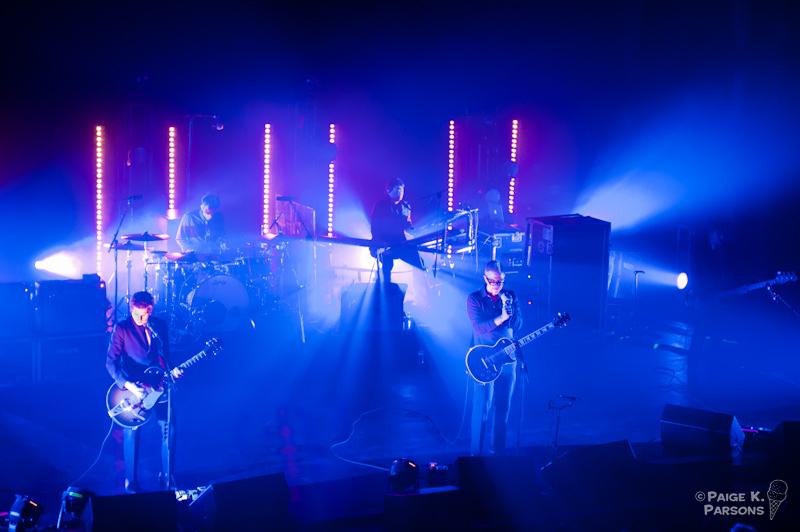 It did create a wonderfully dark yet colorful atmosphere to hear the moody and cryptic Interpol tunes I love so dearly. It also helped that I was shooting with an incredibly fast 1.4 lens that would have allowed me to photograph the band by candlelight. Another subtle but strange juxtaposition were the smiles on the band member’s faces. The lights would brighten for the applause in-between songs and Paul was positively beaming. They all were. Especially towards the end of the night, Paul’s gaze often appeared to be scanning the large balcony. The first few rows of the balcony were always amply list from the huge wash of lights from the stage. Taking Paul’s lead, I found myself scanning the curved edge as well. I was disappointed in all of us. Everyone (including myself) was seated, and while the house was packed, there was a distinct sense of ennui emanating from the balcony crowd. 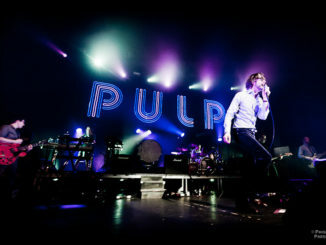 Try as they might, and by-god they did try, Interpol wasn’t able to rouse more than a body or two from a seated position in the comfy seats. To our credit, we did clap along on several occasions, and did give the band a standing ovation at the end of their set. The crowd on the floor was infused with a completely different energy. 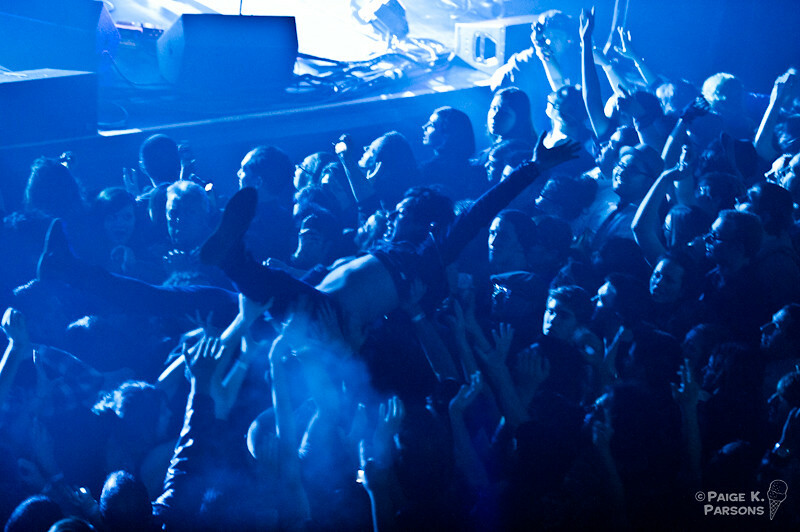 Plumes of pot smoke constantly drifted skyward, and there was plenty of crowd-surfing by a single intrepid fan. Hands were raised, bodys were dancing, and the energy level was much higher in the huge lower pit at the front of the Warfield stage. While Paul was nearly motionless whiel he sang, Daniel swayed and bobbed in constant motion for the marathon of constant frenetic strumming. So some might ask, why do to see a show if the songs sound just like they do in studio? For me, it’s all about the energy and the camaraderie of the live performance. Interpol’s been a putting out albums and touring for over 10 years, and it’s great to see my fellow long-time fans at shows. 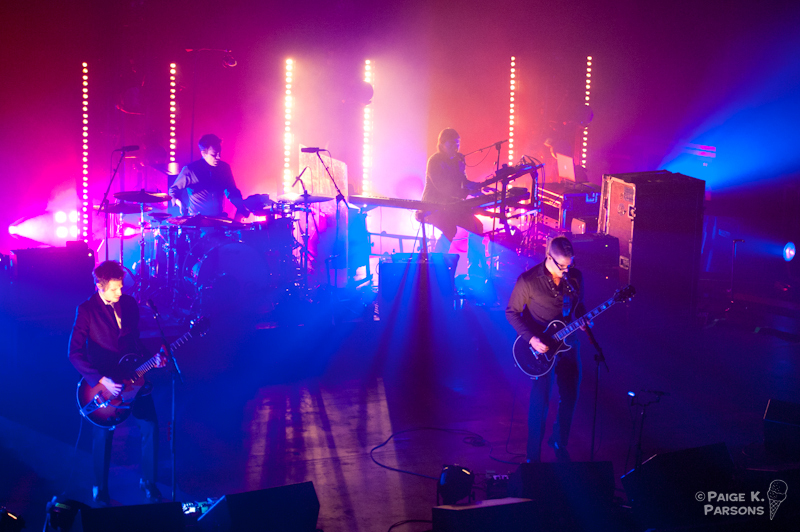 Perhaps the lyrics sum up the reason the best, “It’s a sentimental jury/And the makings of a good plan/You’ve come to love me lightly/Yeah you’ve come to hold me tight.” Interpol, after all this time, we love you guys more than lightly. View the full set of 17 photos on Flickr, or click below to see a slide show.